and I am very excited and honoured to have been asked back to host this months challenge. The theme I have chosen is ‘ Inspired by’ and I hope you will find this fun and join in and tell us what inspired you when creating your artwork. Was it something you saw or heard, a song maybe, or a book or your favourite place, a favourite colour, a memory, a dream, another artist, or an art product or something else ? My page was inspired by a receipt for paints which I then used on the background. I look forward to seeing what inspired you. Wir freuen uns wenn Ihr wieder zahlreich mitmacht und lasst uns bitte auch wissen wovon Ihr inspiriert gewesen seid. War es etwa, das Ihr gehört oder gesehen habt, ein Lied, vielleicht ein Buch oder ein Lieblingsort, eine Lieblingsfarbe, eine Erinnerung, ein Traum, ein anderer Künstler oder ein neues Bastel-/Künstlerprodukt. Ein sehr offenes Thema also. Habt Spaß und vergesst bitte nicht dabei unsere REGELN zu beachten. I wish you a lovely month hosting AJJ Gill! Your example is jst AMAZING! Great fun theme, Gill, and I seriously love your painting, it inspires me! Have a happy month on AJJ. Gill it is a fantastic theme for the month, I have ideas spinning around to use already. Your page is inspirational. A great new challenge from Gill, and a wonderful painting to inspire us! A wonderful opening dear Gill and a great theme for us. Thanks! What a fantastic theme and your inspiration project is perfect! I hope I get a chance to join in. oh what a lovely theme Gill and your page is gorgeous!! Hello Gill, I've been encouraged by a couple of T Tuesday party folks to join this party too. 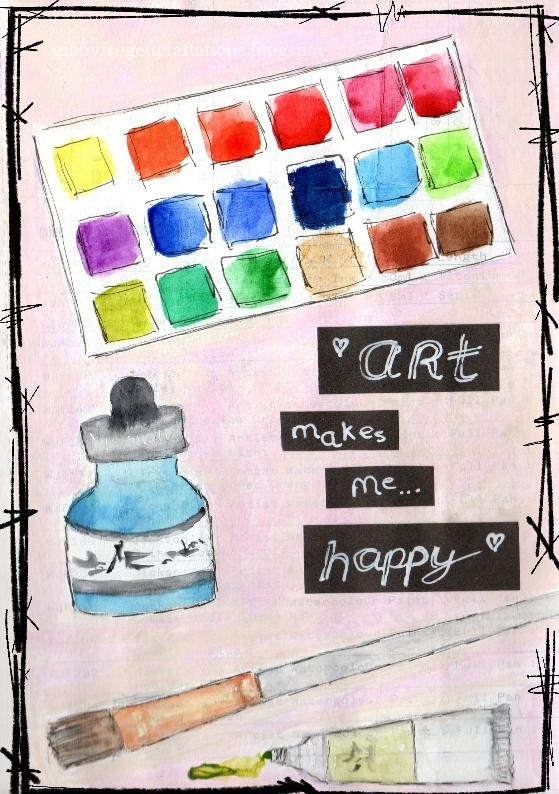 However, my blog post has several pages of art so hope that's ok. Lovely journal page you've painted...art supplies have a way of calling out to us to be used! and Happy T Day! Hi there! It's good to be back for the summer. Blessings! I love the great theme of the challenge! Kisses!